The “aged” Picard of “All Good Things”. “Age cannot wither her, nor custom stale her infinite variety.” Only time will tell if Shakespeare was truly writing about Enobarbus recounting Mark Anthony’s first meeting with Cleopatra, or the countenance of Sir Patrick Stewart, one of humanity’s most enduring structures. Whatever pact with a timeless god Stewart has made to seemingly be incapable of aging, it’s long been a bit of a running joke for the actor—one that he’s actually leaning into while dropping tantalizing updates about his return to Jean-Luc Picard for the upcoming post-The Next Generation miniseries coming to CBS All Access. Speaking to Yahoo about the series—which Stewart noted is currently shaping up like a “10-hour movie,” so make of that what you will—Stewart cheekily noted that while the Picard we’ll meet in the show will be in a very different place from where we left him in TNG and the movies, another thing that’s changed is that he’ll actually be looking younger than the last time he played an “old” Picard. [In “All Good Things”] I grew a beard, and they made me up old. 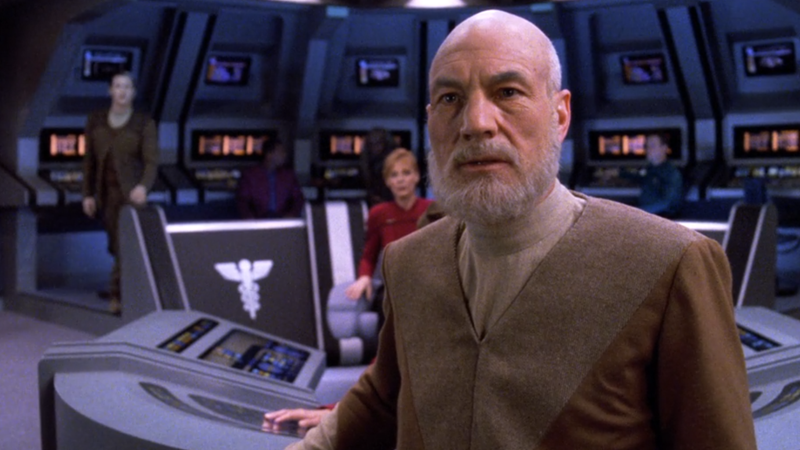 I looked older then, eighteen years ago, than – I don’t think I am saying too much – than I will in the upcoming series… Jean-Luc Picard and Patrick Stewart are the same age.